100 gloves per dispenser box, 10 boxes per case, except for XXL, 90 count. The Emerald Nitrile Powder-Free Tex-Grip Exam glove uses Soft Stretch Modulus Technology to provide a second-skin comfort level. This latex-free, powder-free, textured glove offers the very best in tactile sensitivity, chemical resistance, and blood-borne pathogen protection. 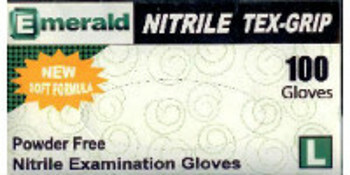 The Emerald Nitrile Powder-Free Tex-Grip Exam glove reduces hand fatigue and has superior tensile strength.